Zebra and Przewalski's horse Conservation Center needs your help to survive, so that the endangered zebras and horses can survive! Hearts & Hands Animal Rescue is now as endangered as the precious animals it conserves! Due to the death of one of its beloved Directors, James Whipple, who was its largest monthly donor, Hearts & Hands is in danger of losing the property it was established on fifteen years ago. James was about to pay a $50,000 single payment due on the mortgage but he suddenly passed away before that could be accomplished. Jim became a founding member of Hearts & Hands Animal Rescue to continue his conservation efforts with others who realized that the Hartmann's Mountain zebra and the Grevy's zebra are soon to be extinct, with the Quagga zebra already extinct. You can help Hearts & Hands Animal Rescue keep this Community Benefit Organization, 501(c)(3) non profit, on their land so that they can keep these zebra species alive on earth. 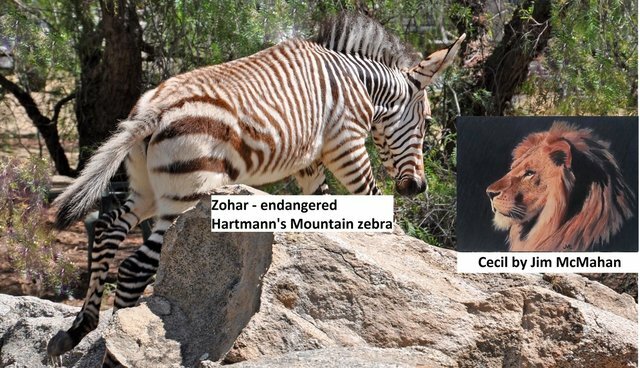 With fewer than 150 Hartmann's Mountain zebras in conservation around the world, and only 750 left in the wild with just a few years left til they are completely gone, Hearts & Hands must stay alive and well with your help so that your grandchildren will see and know live zebras, rather than just see photos of what they 'used' to look like. Dear Cecil, the lion, who was collared and tracked and the favorite lion of multitudes worldwide, was killed by a bow hunting dentist, Walter Palmer, for $55,000. He could easily have saved all the zebras and Przewalski's horses at Hearts & Hands with that money or helped any other charity. But, instead, he chose to kill Cecil with it. Jim McMahan, artist, and animal lover has illustrated Cecil, working around the clock to complete this inspirational piece, so that all animal lover's throughout the world will remember Cecil. Jim is generously offering a limited number of his beautiful illustration to those who donate $35 to Hearts & Hands Animal Rescue, to save the endangered zebras and Przewalski's horses and this facility. To receive your free 13" x 17" limited edition illustration of Cecil the lion go to Hearts & Hands donate page . Please write "Cecil" in the comments box, along with your telephone number, email address, address to send your illustration of Cecil to, and your $35 donation, including shipping. Your tax deductible donation amount is $20. Place this beautiful illustration on a prominent wall in your home or office to never, ever forget what this incredible lion stood for and what you stand for against those who kill for sport. You will be saving from extinction the most colorful animals on earth, the amazing striped endangered zebras with your donation. Together, as one family of animal conservationists, and animal lovers, we can still make a difference. Please donate and get your limited edition illustration of the beautiful Cecil today. If you wish to donate more please do so and if you know someone else who could help to save Hearts & Hands and the endangered zebras, please share this link or contact us at hnhrescue@aol.com or 760-760-3927. Go to our facebook page to see a larger photo of this beautiful illustration of Cecil.